Springtime -- and the impending end of school days -- brings out the kid in all of us. For those adults with kids of their own, no family summer vacation trip would be complete without some time to experience life out of doors in the big city. After you've scouted out some fun, educational attractions, treat the kids (and yourself) to a visit to some of the most amazing modern playgrounds around the country. While playground staples such as monkey bars, slides, and tire swings are still a part of the mix, there are numerous high-end playgrounds across the country, all boasting something unique. Here are some to visit and compare with those fond, albeit flickering, images from our childhoods. 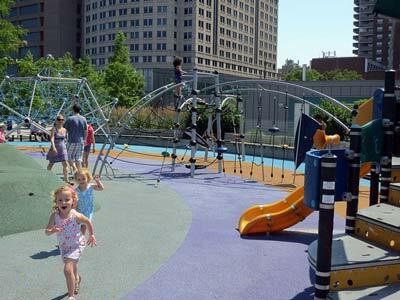 Hudson River Park's Pier 25 Playground is a beautiful, activity-filled diversion for children of all ages. From swings to a climbing wall to mini-golf, kids have a wealth of great things to do. A little further down the line, the Pier 51 Play Area offers some educational attractions, including a replica of Minetta Brook, which was once part of New York City's wetlands. (Wetlands? In NYC?) Kids get to control the flow of water in the miniature brook and splash around in a fun, outdoor setting. Here's the wildcard on the list. Geometry Playground takes playtime and learning to an entirely new level as a true interactive recreational area. It also takes its roving, educational play space around the country. Funded by a grant from the National Science Foundation, the traveling playground exhibit is currently housed in Oklahoma City and scheduled to rotate to the Museum of Ancient Life in Lehi, Utah, in June 2014. Previously, Geometry Playground made its rounds to San Francisco's Exploratorium and the Science Museum of Minnesota in St. Paul. If there is any single playground that children will refuse to leave, then this is it. Part science expo, part theme park, this is one of those opportunities to experience something entirely unique, and extremely fun. A hopscotch skip and a jump from Tampa's attractions, Tarpon Springs' Discovery Playground boasts a beautiful playground that has the look of natural wood, but is actually comprised of a mix of wood fiber and synthetic binding agents to offer splinter-free play. The playground itself has a number of tunnels to crawl through, hanging structures, a rope bridge and pirate ship -- to name just a few fun features. As an added bonus, Discovery Playground is in close proximity to a soccer field and an ice cream shop. Think of Seattle's Lincoln Park as a playground within a nature campus. Encompassing 135 acres, the Park's grounds contain picnic areas, beach front, hiking trails, a boat launch, saltwater pool, ball fields, and a multitude of designated play areas. With so much to see and do, one day is not enough to even scratch the surface. For a play date on this playground, it's best to leave a weekend open to explore as much of this wonderland as possible! If a bit of history mixed in with playtime is more to your liking, then Franklin Square is the answer. Located in Philadelphia's picturesque historic district, Franklin Square allows children to indulge themselves in everything from standard playground fare to a glorious carousel. The added bonus is that kids are playing on sacred ground that hosted our country's founding fathers. No one can say with certainty if little Tommy Jefferson or Johnny Adams amused themselves in Franklin Square, but it makes for a rather romantic notion.